Heroes and Villains is a beautiful signed, limited edition from Subterranean Press. The cover art is by the brilliant Ken Laager, which he originally painted for the issue of Subterranean magazine where "Doctor Helios" first appeared. "Common folk rising to depose despots with unchecked power is the theme running through Shiner’s compilation of three action-packed novellas and one short story. In the strongest work, the precisely plotted alternate history "Black Sun," five stage magicians form an intricate plan to take down Adolf Hitler in 1934 Germany. Led by Ernest Adler (aka the Amazing Adonini), a hypnotist, an escape artist, an impersonator, and an illusionist prey on Hitler and his henchmen’s belief in the occult. The far-fetched plot is made plausible by sustained suspense and single-minded characters. In "The Next," frumpy lawyer Tom Davis and reporter Susan Altman investigate a killing in modern Los Angeles and discover a cabal of predatory mutant bloodsuckers. The allegorical "Doglandia" focuses on Bruno, a Rottweiler, who teaches other dogs to fear cats and starts a war at a city dump; corgi Toby and cat spy Rita manipulate Bruno with false flattery and rouse resistance from the ranks. 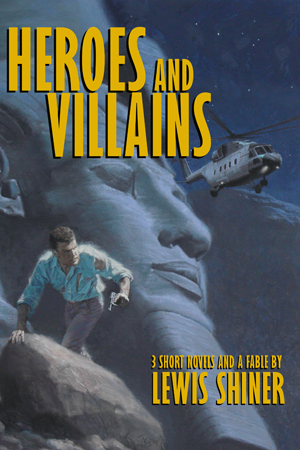 The atmospheric James Bond–esque thriller "Doctor Helios" has a CIA agent confronting Chinese and Russian spies who are plotting to destroy the Aswan Dam in 1963 Egypt. High adventure, exotic locales, and beautiful women all triumph. Shiner (Collected Stories) merges well-researched and detailed historical elements with cinematic action and crisp writing." "What Shiner is doing with these familiar elements is neither emulation nor parody but deconstruction...This is a political and an ethical work, dark-shaded, more in the spirit of Le Carré than Fleming...a love letter to Egypt, at least to the Egypt that was in 1963, and the Egypt that might have been." —Lois Tilton, Locus, on "Doctor Helios"
"This collection of fascinating Lew Shiner novellas is first-rate from end to end, with a wild range of subjects. I settled on 'Doglandia' as my favorite, but then I read 'Dr. Helios'..."
"It's a parable about the One Percent, which includes among its action set-pieces a killer-diller car chase and a flight from hired killers in an elaborate enemy stronghold...it works very well, a series of precarious situations and hair's-breadth escapes that emerges as fully satisfactory." —Adam-Troy Castro, Sci-Fi, on "The Next"